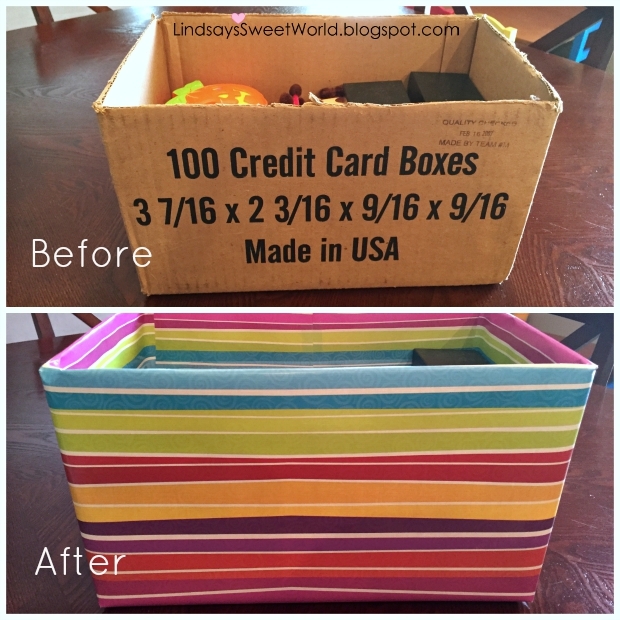 As promised, this week I’m finally sharing my new gift wrap storage space. I’m sure by now that you all know that I get extremely excited about organization of any kind – I love my planner, I love compartments, and I love bins and baskets and jars and labels. If I had it my way, I would slap a label on every single bin, drawer, and cabinet in my whole house. Y’all remember how Monica on Friends labeled all of her coffee mugs so that if one of them ever went missing she would know which one it was? However, the reality is that there are other people living in the house with me, so I have refrained from getting too crazy with the label maker. I don’t want to push Brian off the deep end just yet. I am, however, the main wrapper of the gifts in our family, so I thought that it would be perfectly acceptable to go a little overboard when organizing the gift wrap. It just makes good sense to have everything neat and tidy (and labeled!) because it makes it easier to find what you need right when you need it. Before we get started, how about a “before” picture? Yeah, it was hideous. While I thought I would love this little gift wrap cart, it was way too small, and it didn’t have the storage that I need. Not to mention, it was totally out of place in this closet that we use to store our kitchen trash can and cleaning supplies. I never liked having it in there, and it was always such a pain having to move everything around in the closet just to get to the vacuum. Anyway, the storage rack that I used for the new storage system is an old retail store rack, so the shelves are spaced fairly close together, which is perfect – since they are so close together, there are more of them, and there is no wasted space in between shelves. We got three of them for free right before we moved into our house six years ago, and we originally used them to line the back wall of our garage to store tools and other outdoor equipment. Now that we have our new outdoor utility closet, we no longer have a use for the racks, so I was literally dragging them up to the curb for trash pick-up when it occurred to me that these would be perfect to organize my gift wrap. And one rack just so happened to be the exact same width and depth as the empty space behind the door of the closet that we just added on to the house. It was obviously meant to be. I stopped the madness, cleaned it up, hauled it in, and got to work! The next step was to clean out all of my gift wrap and group like items together so I would know exactly how much space I needed for each category. Once this was done, I mapped out the category placement. Once I knew my plan of attack, I got to work, filling in each of the shelves with their corresponding items. I found it easiest to work from the bottom, up. Don’t ask why. I have no explanation. On the bottom shelf, I stacked shirt boxes on the left, and other odd size boxes on the right. On the second shelf from the bottom, I grouped the Valentine’s, Easter, Halloween and other non-Christmas holiday bags together to make an “Other Holiday Bags” category and then all of the Christmas bags are stacked on the right. On the fourth shelf from the bottom, I stacked birthday bags on the left and everyday bags that could be used for any occasion on the right. On the fifth shelf from the bottom, I loaded all of my Christmas wrapping paper onto the shelf. And let me tell you, the width of this rack could not be more perfect for wrapping paper. Finally, on the sixth shelf from the bottom (AKA the second shelf from the top), I loaded all of my birthday and everyday wrapping paper onto the shelf. This left all of the miscellaneous wrapping items (or wrapping accessories, if you will) for the top shelf, and I knew that I wanted to keep those organized in different containers. Bows are in a tall plastic storage box in the back, gift card boxes are in the original cardboard box that they came in (that I wrapped to make it pretty – duh), ribbon and gift tags are stored in similar stacking boxes on the left side, paper scraps are stored in two cute little tin buckets that I purchased in the Target dollar spot (we don’t waste pretty paper around here! ), and tissue paper is laying right in the front for easy access. I added a caddy for tape and scissors, and voila, the perfect gift wrap storage rack was born. After everything was organized, I stood back to admire my work and it was then that I realized that there were slots on each shelf for labels and a big slot across the top for a sign. Holy organization, Batman. It was about to get crazy. Three sheets of cardstock, one piece of foam board, one printer, one pair of scissors, and one hour later, and everything was happily labeled and making my organization-loving-self swoon. And now? Everything is in one place. I can see everything that I have, so I know all of my options. No more digging through mounds of bags to find one for the right occasion, no more searching through rolls and rolls of wrapping paper to find the right one, and no more rearranging an entire closet just to get to the vacuum. Lindsay = one happy girl. This is simply amazing!! What an awesome way to re-use that rack, it's perfect!! And I agree, I never throw away gift bags! Thank you! I love it so much!! Thank you, Marie. I love it so much! I'm always a little wary of the holiday season because of the needs and commitment to wrap gifts. A lot of people struggle with the actual practice of the gift-wrapping itself, but for me the problem begins with the paper and the scissors and the tape and everything before I even put the gift on the table. Your organizing tips would be a great help. Gosh with the amount of supplies you have in storage, you could run a gift wrapping shop I think! I am very happy with wrapping in newspaper or brown paper. It's got a certain rustic quality to it all! Haha! Yes, it's quite ridiculous! But hey, at least I don't have to run out for a bag or wrapping paper every time I buy a gift! Lol.